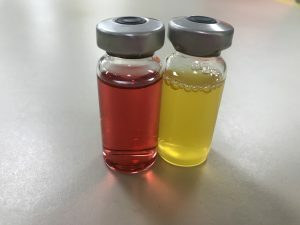 Biocorrosion is a major issue and results in elevated costs, risks and a host of operating problems for the petroleum industry. Around 20-30% of this corrosion is related to microbial activity. Such microbiologically influenced corrosion (MIC) affects the integrity, safety, and reliability of petroleum pipeline operations. The responsible bacterial populations originate from hydrocarbon and groundwater sources within the subsurface, or are introduced during the water flood of secondary oil recovery. These bacteria cause problems from production string to transmission pipelines, and through refinery, storage and even in end-user vehicle fuel tanks and fuel filters. Current technologies used to control microbial contamination include the use of chemical biocides and mechanical scraping of biofilms formed in pipelines with ‘pigs’. Chemical biocides are at best only marginally effective and are expensive, dangerous, and even toxic to humans and the environment. In particular, chemical biocides are largely ineffectual against sessile bacteria protected in the complex communities known as biofilms, and it is exactly these chemically resistant biofilm communities that are the source of most biocorrosion. Industry needs a perfect bactericide: cheap, safe to handle, natural, environmentally benign, and focused on the problem bacterial species sequestered in the biofilms. The group of bacteria most commonly associated with MIC in petroleum pipelines are the sulfate-reducing bacteria (SRB). SRB reduce sulfates to sulfides, releasing sulfuric acid and hydrogen sulfide as byproducts which reacts with iron to form the characteristic black precipitate iron sulfide.1 Hydrogen sulfide gas is not only extremely toxic and flammable, but it causes souring of the petroleum product, resulting in reduced quality and increased handling costs. The term “SRB” is a phenotypic classification and several distinct lineages of bacteria are included under this umbrella term. The most widespread are members of the delta subgroup of the Proteobacteria, including Desulfobacterales, Desulfovibrionales, and Syntrophobacterales. Regardless of taxonomic origin, the SRB develop in complex sessile assemblages along with other species, in biofilms attached to the inner wall of the pipeline, frequently in the “6 o’clock” position. The extracellular matrix of the biofilm is produced by the communal bacteria and is usually composed of sugar polymers commonly known as exopolysaccharides. Biofilm forming bacteria cause pipeline corrosion, production slowdown, product quality loss (souring), potential environmental hazards, and the well publicized leaks which are a detriment to company and industry image.